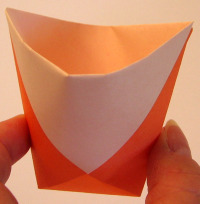 This origami cup is a very old traditional model. It's one of the easiest models to fold. If you run out of paper cups, knowing this model can come in handy...really! You might only get one use out of it, but it works. A big origami cup turned upside down makes a fine hat. For adults, make it out of a piece of paper at least 21½ inches square, which you can cut from a full sheet of newspaper. For small children, try a hat about 18-inches square. To make the brim, we decorated a flap with scrapbook paper. Then we cut it into a perfect arc using a big round platter as a guide. 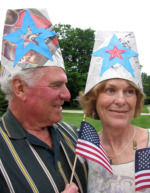 < These happy parade-goers are wearing newspaper hats with the flaps tucked inside. Your party guests might get a kick out of making their own popcorn or snack bag. 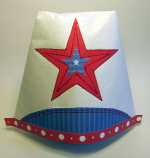 All of these cups are decorated with our One-Cut Betsy Ross Star cut from colored photocopy paper. 1. If your paper has a "wrong" side, start with that side up. Fold it in half, corner to corner. 2. Fold one of the lower corners to the opposite side. Try to keep the edges indicated by the arrows parallel. 3. Fold the other corner to the opposite side. 4. Fold the top flap down, locking the crisscrossed flaps in place. 5. If you want, you can hide the flap by tucking it inside the top crisscrossed flap. 6. Turn over and fold down the remaining flap. This flap can also be tucked inside, or left outside as a hat brim. Here's how the two sides look with both flaps tucked in.